This film sent me dreaming of travel and I was left spellbound by beauty. 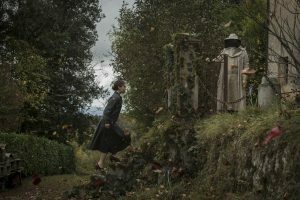 Tuscany never looked more ethereal and poetically imagined as it does in the romantic horror film, Voice from the Stone. 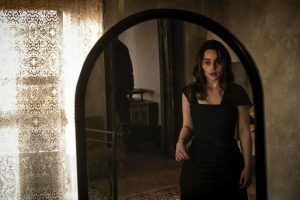 Like the teachers in Gothic romances I read as a young girl, Verena (Emilia Clarke) travels from European castle to castle, a savior for the families of children with special emotional needs. Voice from the Stone is the feature film directorial debut of Eric D. Howell. The movie is based on the Italian novel “La Voce Della Pietra” by Silvio Raffo. Shot on location in Tuscany, the film is a haunting tale of romance and something deeply sinister. In her desire to help Jakob, Verena becomes more and more a part of the secrets, hidden inside the walls of the aging castle. As soon as Verena enters the grounds, we can almost feel the pull the very house has on her. Not believing at first that the boy really hears his mother’s voice in the walls of his room, she quickly becomes aware that her job to help Jakob speak again, may not be as simple of a case as her other wards have been. Is what she is experiencing real, or what the ghosts of the house want her to see? Jakob, she is told, stopped talking the day his beautiful mother died. A mother that died whispering to him that another woman would come to care for and love him. A mother whose voice he hears everywhere. The longer that Verena is in the house, the more she feels like someone else is inside her. Donning the dead woman’s clothes, and posing naked for Jakob’s sculpter father Klaus, (Marton Csokas) is not like her at all. Is she being possessed? Isolated, frightened and confused, she fights against whatever is trying to take her over, while realizing that there is more to the voices Jakob hears, than she had originally thought. 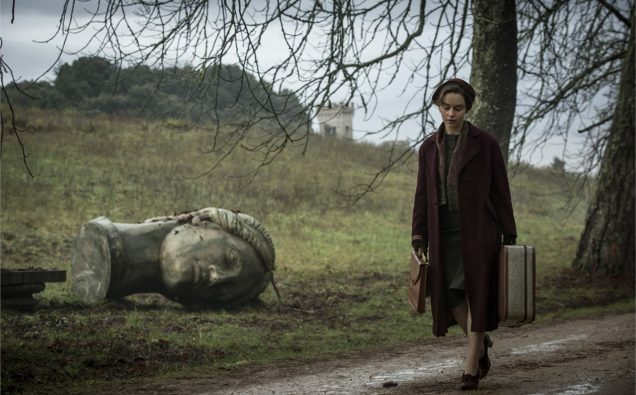 Voice from the Stone is not a horror movie that will satisfy those who like bloody films. It is cerebral and a visual feast. As a photographer, I wanted to stop each frame and save them, they are that lovely to look at. The emotion in the movie is as important as the scares, and yes there are some. The end is satisfying, just relax and it will surprise you. Voice from the Stone reminds me of movies like The Orphanage and The Others. This may not be a film that will appeal to most men, as much as women, it is sensual, chilling, mysterious and I loved it. 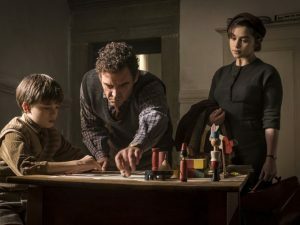 Voice from the Stone opens in theaters, VOD and Digital HD on April 28th from Momentum Pictures. Singer Amy Lee (Evanescence) performs the beautiful song inspired by the film, called “Speak to Me”. Enjoy the video on iTunes here.